The announcement that members of the notorious British police force would be taking part in the historic parade came as a shock earlier today [Friday] as news spread rapidly across the internet. It would have been the first time members of the operational British Crown forces would have taken part in an event long associated with the opposition of it organisers to British rule in the north of Ireland. 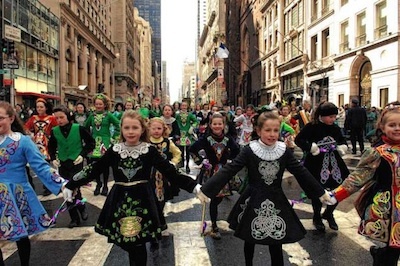 But in a statement this evening, the NYC Saint Patrick’s Day Parade Committee said it had already reversed its decision. It said the plan to invite the PSNI contingent had come at the request of the Counsel General of Ireland, at the Irish consulate in New York. “However, many of our loyal supporters and parade participants passionately advocated against the PSNI’s participation,” they said. “The people of New York City have supported our parade for many generations. While the decision to invite the PSNI was made in an effort to foster peace, we must stand behind those who help make our parade the greatest in the world. The six PSNI members were to have been led by a chief inspector and partially shielded by members of the 26 County Garda Siochana police throughout the route of the parade. The apparent US effort to normalise British rule in the north of Ireland comes as an extension of a decades-long campaign in Ireland itself, which has seen the PSNI enter schools, public bodies and publicly-funded sports organisations to solicit the support of the northern nationalist community. This week’s development still came as a surprise, and threatened to overshadow St Patrick’s Day celebrations in New York and beyond. In the end, however, it served only to bring British-sponsored police brutality and oppression in the north of Ireland back into the spotlight. The backlash today was greater than the inclusion in the parade of gay rights groups, long refused permission to march because of the potential for angry exchanges with spectators. The dispute came amid the annual battle for American hearts and minds by both Irish and British agencies ahead of the St Patrick’s Day gathering at the White House in Washington DC, a key date in the political calendar on both sides of the Atlantic Ocean. The action campaign credited with reversing the decision saw hundreds of Irish Americans contact the the New York City Parade Commission today. Their offices and the office of the Irish consulate were said to have been besieged by angry callers, and an online petition also gathered hundreds of signatures within hours of its launch.